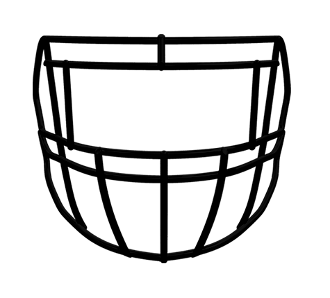 Anyone looking for an all-purpose facemask will love the Riddell Revolution Speed Football Facemask S2EG-II-SP. Designed with two extra bars in the peripherals, the S2EG-SW-SP will keep stray fingers from penetrating and poking your eyes. This facemask also includes two horizontal bars in the middle and three vertical bars over your mouth for added protection. This configuration or bars provides a great combination of vision and protection and is recommended for any position.